This is the second part of an article on Big Data and Data Science. (Here is the first). I thought I would put down a list of skills, algorithms and the stuff of a Data Scientist. Clearly this is my opinion but I would welcome feedback. I also try to arrange requirements in a hierarchy of importance. 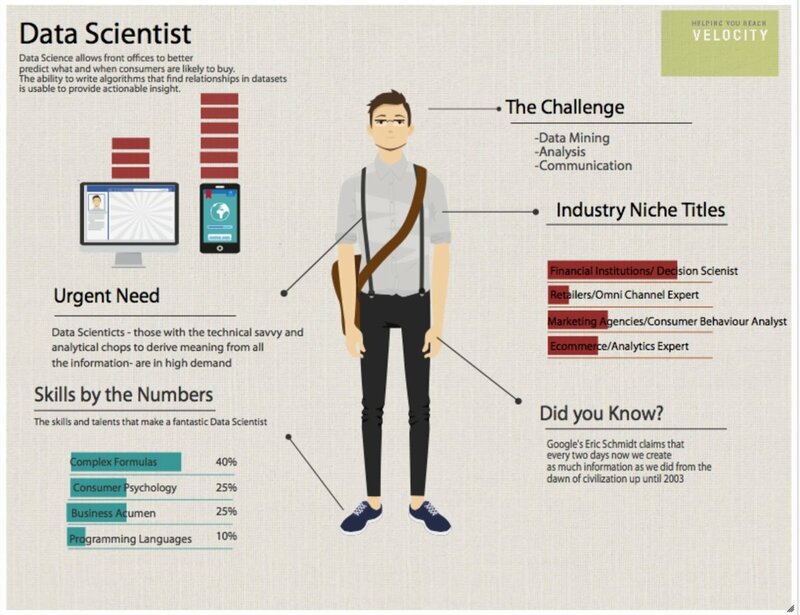 First and foremost a Data Scientist should be a Scientist. They need to understand what a hypothesis is and what constitutes a proof. They need to be able to communicate with the business, first to develop something useful and then to relay their success. Clearly there is overlap with a Business Analyst, Business Intelligence, Software Engineers, Statisticians and more. The difference often can be represented through the tool set. There is an awful lot in the above but it comes down to science training and domain understanding. Then of course a Data Scientist needs to be able to successfully execute a plan. For this they need raw data skills – for example SQL (e.g. Postgres). A Data Scientist does not necessarily need a lot of data. Normally they are involved in extracting and analysing real time data. Thus, they may need Big Data query skills, such as Hive or Pig. Taking a step backwards, a Data Scientist may be required to help develop requirements for some Big Iron needed for Big Data. A whole lot of work may be needed to define the physical architecture, operating system (or overlay such as Hadoop) and Application Software. (More about Application Software later). While some tasks are not within their domain, they should be consulted and must have input. A critical approach is to iterate this process. Initial a Data Scientist may help setup hardware, do a static data pull, define a model and analyse the model. Then later they may do a dynamic data pull into an application that provides real time feedback. Then as a third iteration, they may wish to perfect the model and get arms-length feedback into the business. A data scientist should have a broad general knowledge about PaaS, XaaS, micro services, Cognitive Computing, IoT and so on. The data scientist should read a lot so that they have ideas for social network and online models. Typically they would exercise these models using MatLab or Mathematica. The following lists of skills, tools and algorithms are neither complete nor necessary, but are intended to partition technologies. Database knowledge should include relational databases, NoSQL (like Neo4j) and others. Some companies have proprietary visualisation and reporting tools. SSIS, SAP DS, IBM DataStage, Pentaho. In the next section, we look at the definitions of some specific languages, distributions, algorithms and tools. 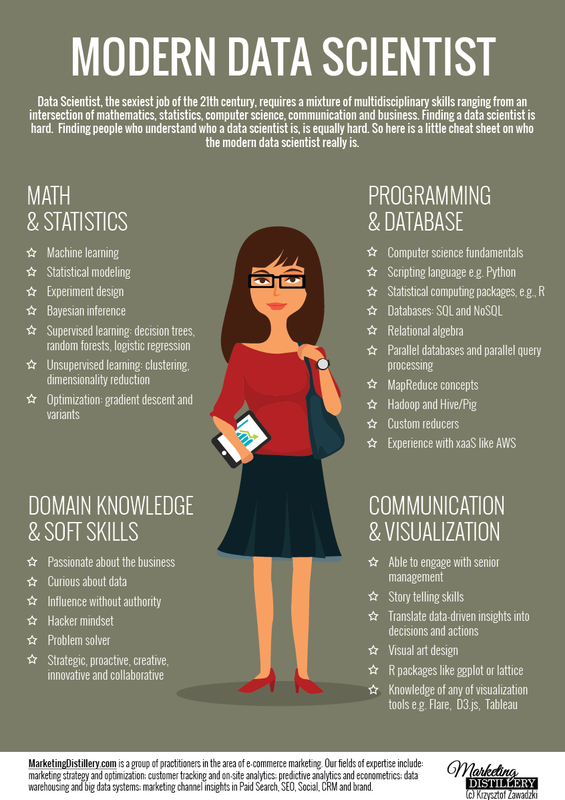 These are frequently thrown up as necessary requirements for a Data Scientist, but in actual fact after everything else, these may be needed and can be learned. It is far more important to be able to understand the the need for a model in the context of the business than being able to extract some data that really means very little (e.g. drawing actionable conclusions).